When you walk into Express MiE you’re greeted by a smiling and helpful face. That would be Alex, Express MiE Manager. Or maybe you met her in Dance Sculpt, as she kicked your booty with her high energy work out! Alex is a huge part of Express MiE. She’s kept the studio running smoothly for the past 1.5 years. She loves connecting with students and staff. It’s bitter sweet for us to announce that Alex will be stepping back from her manager role as she explores other opportunities in her life. We’re so grateful for all that Alex has done for Express MiE and wish her the best! She’ll be with us through the end of this session…and don’t worry, you may still see Alex around the studio in Smile session and beyond for Dance Sculpt, workshops and more. We wanted to honor this amazing woman with a staff spotlight before she leaves us. Read on to learn a bit more about this dynamo. Q: What brought you to Express MiE/Pole Dancing? Alex: I love the positive, empowering community of women at Express MiE. I took my first class about 6 years ago and came back when I owned my Lingerie Boutique next door. Quickly I became a part of the Express MiE family and love all the women who work and dance here! Q: How long have you been dancing? What has kept you dancing? Alex: I have been dancing since I was 3. I’ve tried all kinds of dance over the years and find that sensual dance and pole dance are another way for me to express myself. Dance is a release for me! I love how no matter what type of day I’m having: good, bad, happy, sad, I can come dance and express my emotion. Dancing makes a wonderful day even better and can resolve any stress on a bad day. Q: What is your favorite part of teaching dance? Alex: I love teaching Dance Sculpt and having fun while working out! 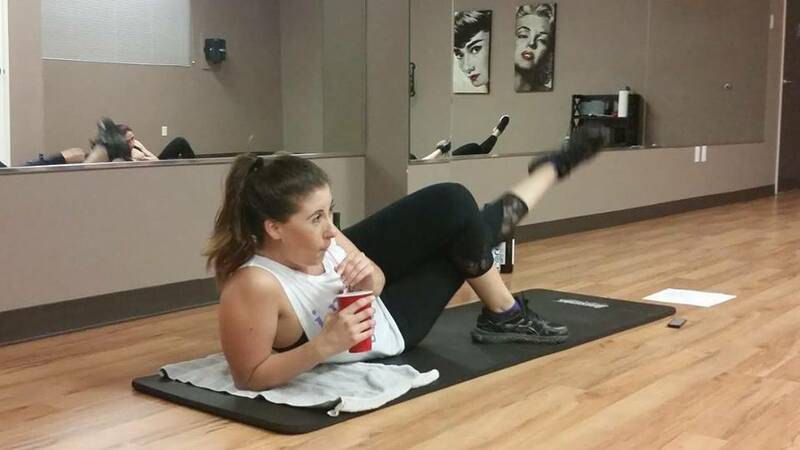 I love encouraging my girls to push themselves while also supporting their fitness journey. I’m excited to stay part of the Express MiE community as a teacher. Q: What would you say to someone on the fence about trying out Express MiE? Alex: TRY IT! Express MiE is such a welcoming environment. All the instructors are so encouraging and supportive. Q: What are your hobbies outside of dance? Alex: I run a local nonprofit, Opportunity4Kids, which gives underprivileged kids opportunities in extracurricular activities. I love working with the community to increase awareness of poverty in the valley while also raising funds to give to those in need. Q: Do you have kids/pets? Alex: I have 2 dogs- Baron and Rica. They are my fur babies! They provide so much entertainment in my life and I love when we all go hiking together. Q: What is your favorite quote or personal motto? Alex: “A smile is the best makeup any girl can wear”- Marilyn Monroe. I am known for always having a smile on my face! I feel like it’s a simple thing I can do to brighten up my attitude and everyone else’s day. As you can see, Alex is a force to be reckoned with, and while we’re sad to see her go, we know that she’s going to do great things in all her future endeavors! We’re also thrilled that we’ll still see her around the studio in a teaching role. Be sure to stop by the front desk and send her off with good vibes and love. Thanks Alex, for all you’ve done for Express MiE! Alex leads our wine workout classes. The best combo of two of her favorite things and the best happy hour in town!